With Fall coming sooner than many of us might think – fresh Apples will be in season soon, especially up here in the Apple Capital of the world – the Pacific Northwest. 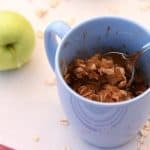 And what’s Fall and Apples without a homemade Apple Crisp in a Mug?? I designed this recipe to match as much of Grandma’s Apple Crisp flavor as I could, without using any butter, margarine, or oil, and also to be a single serving in a mug – because trust me – you don’t want an entire casserole dish of this stuff! It’d be gone in seconds it’s thats good! Both the wife and the daughter gave it a very energetic “thumbs up” so now it’s your turn to try it. Fresh Apples, a little Brown Sugar, Cinnamon, and Nutmeg make up the filling, while the crumb is a combination of Oatmeal, a scant teaspoon of flour, and a little Peanut Butter to bind it all together. This is also the very first recipe I tried making a video for! I spent the better part of my morning driving around looking for some kind of smartphone clamp that wasn’t a ‘selfie stick’. Thank you Barnes and Noble for having the perfect solution. The recipe in it’s entirety will be posted below – but I’m putting the Video on my member’s only page over at Patreon. If you’d like to come on over and visit us (and see the video), there’s some really cool perks for becoming a member. So come on over and say hi! Click here to visit our Patreon Page! Oh and enjoy the recipe! Peel, core, and then dice a single Apple of your choice. I like Granny Smith Apples for this recipe, but use whatever you have. 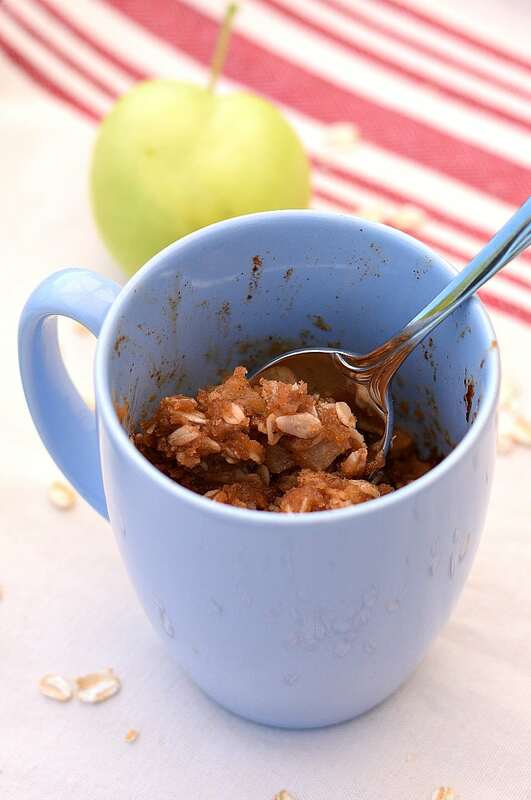 Place your diced Apple in your favorite mug, and then add the Lemon Juice, Cinnamon, Nutmeg, Cornstarch, and Brown Sugar. Stir well and microwave for 1 minute. Your microwave times may vary as I only have a low power 700W unit. You may only need 30-45 seconds to heat up the apples and cook them down a bit. Next, in a sparate bowl, mix the Oatmeal, Brown Sugar, Flour, and Salt together. This will be our topping. Now traditionally butter is used to make a crisp – even Vegan Butter – but that’s still way too high in fat. I used 1 Tbls of Peanut Butter mixed with 2 Tbls of Hot Water and it worked perfectly. Still a little fat, but plant based and not animal based, plus the Peanut Butter gives us a little Protein and Fiber as well. Whisk the hot water and peanut butter together until it’s smooth and uniform and then stir into the oatmeal mixture. Finally, spoon the topping over your apples and microwave for an additional minute. Leave your comments below and let me know how you like it. 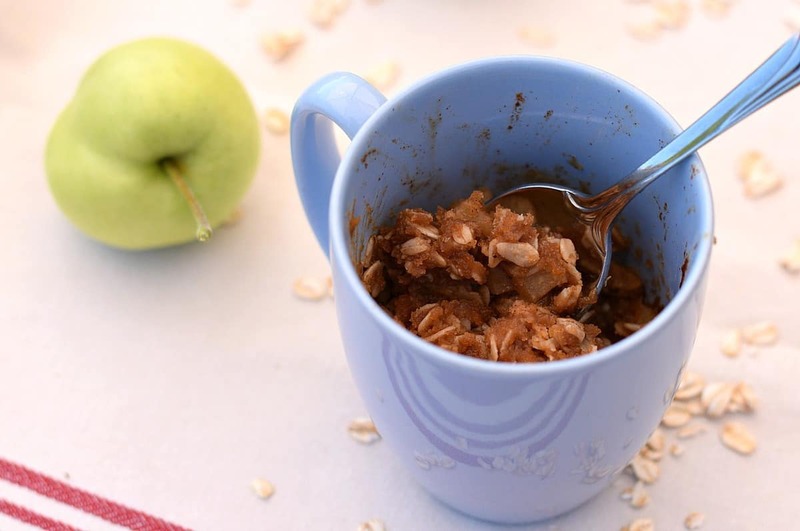 A quick and easy microwavable Apple Crisp that you cook in a mug. Ready in under 5 minutes. The perfect treat after a hard days work. In a small bowl, combine Oats, Flour, Brown Sugar, and salt. It was a hit, everyone like it and it was easy and fast! I love your potato rolls so much that I think I’m going to try and make cinnamon rolls out of it. Because cinnamon calls for butter, I thought of getting the chunkier applesauce and spread out on the dough with cinnamon. Roll up and slice. Then drizzle with powder sugar and plant milk. I’m learning to cook and get creative and your recipes inspire me. I love this recipe. It is quick and easy and tastes great. I think I will use cashew instead of peanut butter next time, though, because the peanut kind of overpowers the apples. This is a great recipe and easy. I am allergic to several foods. One of course being dairy. I used blueberries in mine since the were on sale and I had to use some quickly. I had a recipe that used oil but did not like topping. I am allergic to tree nuts but peanuts.. It turned out great and I really love the flavor. I did not have creamy peanut butter only crunchy but still tasted really good. I plan to get some creamy peanut butter as stated in your recipe. Thank you for coming up with such a unique recipe. This will be my recipe from now on plus it is so easy.